Join us for a lecture and conversation with Rashida Bumbray on the her choreographic works, curatorial projects, and her experience with social justice in the non-profit sector more broadly. Rashida Bumbray is a curator and choreographer living and working in New York. She is also the Arts Exchange Senior Program Manager at the Open Society Foundation. She was the guest curator at Creative Time for the public art exhibition Funk, God, Jazz and Medicine: Black Radical Brooklyn, on view September-October 2014. 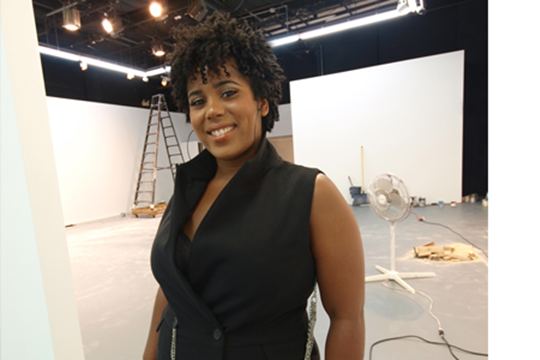 From 2006 to 2011, Bumbray was Associate Curator at The Kitchen, where she organized several critically acclaimed projects and commissions, including solo exhibitions by Leslie Hewitt, Simone Leigh, Adam Pendleton, and Mai Thu Perret as well as performances by Derrick Adams, Sanford Biggers, Kalup Linzy, and Mendi & Keith Obadike among others. Bumbray has commissioned new-music concert works at The Kitchen by such artists as Alicia Hall-Moran, LaTasha N. Nevada Diggs, Marc Cary and Guillermo E. Brown and dance works by Kyle Abraham, Camille A. Brown and Jason Samuels Smith. Bumbray began her career as Curatorial Assistant and Exhibition Coordinator at The Studio Museum in Harlem, where she co-founded the ongoing lobby sound installation StudioSound and Hoofers' House, a monthly jam session for tap dancers - now called Shim Sham.